Lice are a common problem in kids these days. The infestation may come from many sources. Kids go to school, play in the playground and interact with many people. The lice can be infested due to any of the above sources. Tying the kid’s hair while it is wet can also cause an infestation of lice. Louse is a parasitical insect which mainly resides in the head area. They consume nutrients from the scalp. It is better than they are eradicated as soon as possible as they multiply easily and are very tough to wipe out. Besides kids, many adults also suffer from the infestation of lice. Women Hair Loss may or may not be attributed to lice. The scientific backing of such a statement is still unavailable as research continues. Combing the hair with a comb specially for the purpose is the best option.It can be used in combination with other lice removal methods. Combing regularly should be undertaken after wetting hair.The comb is efficient in taking out the lice.It is used to omit the nits.If the nits are left behind, then the infestation might continue.It should ideally be done after a shampoo while the hair is still wet. Such measures ensure that the maximum lice are removed. It’s a good idea to use both the methods in combination. After the combing, the combs should be dipped in hot water for a duration of 10 minutes. The hot water will kill any lice or nits which might be left behind. If any are left behind, then they will be killed.Hot water is an effective disinfectant. You can remove them with tweezers as well. Though the process may cause discomfort, it is an effective remedy. The process should be undertaken after parting the hair. If the hair is divided into sections will be easier to clean.Divide the haiur into different sections and tweeze accordingly. Consider cutting your child’s hair.. Long hair is what the lice just desire.It spells nutrition for them. So the shorter the length of hair, the easier it is going to be for you. The longer the hair, the harder it will be to eliminate the parasites. So it is better to consider cutting the hair. The short hair will be easier for you to manage as well as employ methods of lice removal.The hair can be grown later on.But if the lice continues to infest,it will pose a lot many problems.Sometimes ,the infestation may create scratchy conditions in the skin. 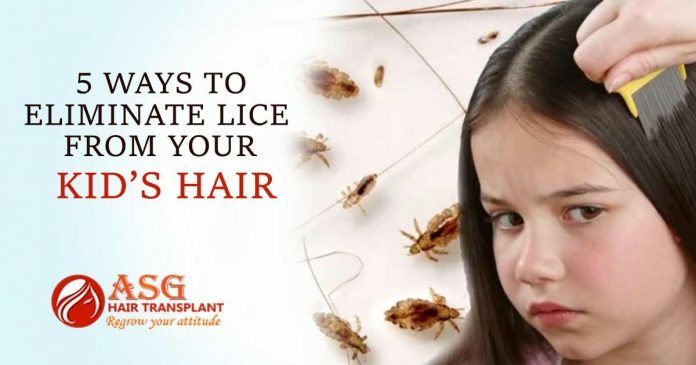 Once you have extracted the lice and nits from the hair, it is best to stick them to a tape, roll it to stick to itself and dispose of the same in a plastic garbage bag. Hopefully, all the lice will be dead and disposed. If however, any nits remain, you will have to repeat the cycle. Previous articleThe new study claims that now hair can grow without any side effects! Next articleDo You Know Everything About Botox Treatment?